Far be it from me to infringe any journalist's right to pour contempt on Perry's head. 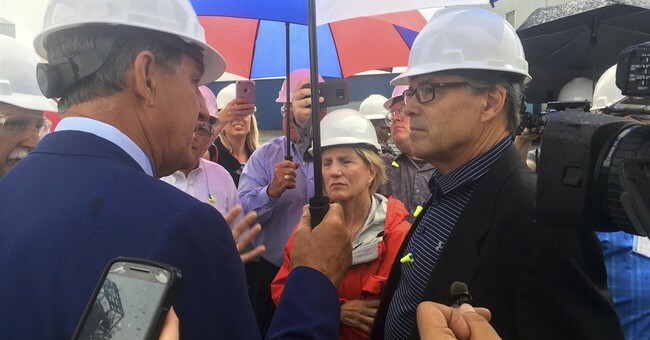 But it might be worth mentioning that before he became energy secretary, Perry spent 14 years as governor of Texas and presided over an incredible economic boom. On Perry's watch, Texas — driven by surging growth in oil and gas production — generated more than 30 percent of all new American jobs, and did more than any other state to lead the US out of the Great Recession. Between the rise of natural gas, the political support for renewable energy, and the closing of older coal plants, many have assumed that the death of the coal industry is inevitable. But reports of coal's demise may be premature. "The improbable happens regularly when it comes to energy," writes economist Mark J. Perry, a scholar at the American Enterprise Institute (and no relation to Rick Perry). Just as the new technologies of fracking and horizontal drilling unexpectedly made it profitable to extract oil and gas from shale deposits, so too the newest clean-coal technologies, some still in their infancy, "could upend perceptions about coal's environmental impact." In other words, those at work in the coal industry shouldn't give up on themselves: That was the context of Secretary Perry's visit to West Virginia. And that was the point he was making when asked how coal can hope to contend with the price advantages of shale gas. His answer — "put the supply out there, and the demand will follow" — wasn't intended as a microeconomics tutorial. It was intended to hearten workers at the leading edge of clean-coal power generation. Perry wasn't implying that no matter how much coal the industry produces, there will always be a demand for it. He was expressing confidence in the continuing ability of coal to compete in the energy marketplace, despite all the ways in which that marketplace is changing.